Payment Instructions: Terms: Payment is required day of auction via credit card. Shipping Instructions: Items 200 Lbs or less will be packaged and shipped at the buyers expense within 3 days following the auction. Insurance will be at the discretion of the buyer. Buyer must contact auction company and verbally indicate insurance is necessary. The cost of insurance will be added to the shipping/handling total. We always try to keep shipping and handling costs as reasonable as possible. If there is a certain company that the buyer prefers to ship and handle your items, please inform us after the auction as we are able to choose from all major shipping companies. If picking up items, all items MUST be removed within 7 days of auction. Please contact Frank Roering (320) 290-8490 or Allen Henslin at 320-979-1808 with any questions. Checkout Date & Times: If picking up Items, all items MUST be removed within 7 days of auction. Please contact Frank Roering (320) 290-8490 or Allen Henslin at 320-979-1808 with any questions. Terms: Payment is required day of auction via credit card, 5% additional will be charged for credit cards. $10 additional will be charged if sending money via, wire transfer, $20.00 for International wire transfers Statements made on Sale Day by Auctioneers take precedence over any and all printed matter. The information given is believed to be true and correct to the best of the owner's knowledge. There are no guarantees expressed or implied. Everything sells 'as is'. All sales will be considered final when awarded to the high bidder. This auction is arranged and conducted by Henslin Auctions Inc. (320) 365-4120, Corner of Hwy 212 & Main St. in friendly Bird Island, MN **Please call Frank at 320-290-8490 to have the auction staff walk around equipment to give condition details. ** Shipping and shipping arrangements are the buyer’s sole responsibility. Items MUST be removed within 7 days of auction. Please contact Allen Henslin at 320-979-1808. Minnesota excise tax of 6.5% will be charged on all titled items. Bidder is responsible for all license and title fees. If titled vehicle is purchased you must come to the Henslin Auctions, Inc. office to complete the appropriate paperwork. All property is sold “AS IS”, and ALL SALES ARE FINAL. Property is open to thorough public inspection. It is the Bidder’s responsibility to determine condition, age, genuineness, value or any other determinative factor. Henslin Auctions, Inc. may attempt to describe the merchandise in advertising, on the Internet and at the auction but makes no representations. In no event shall Henslin Auctions, Inc. be held responsible for having made or implied any warranty of merchantability or fitness for a particular purpose. Bidder shall be the sole judge of value. Bidders who bid from off site and are not present at the live auction or preview understand and acknowledge that they may not be able to inspect an item as well as if they examined it in person. It is the Bidder’s responsibility to determine condition, age, genuineness, value or any other determinative factor. Henslin Auctions, Inc. shall endeavor to describe in detail each item and any pertinent information about it. Henslin Auctions, Inc. will not be responsible for any errors or omissions in the description of the merchandise unless it is a material and intentional misrepresentation of the item itself. Bidder agrees that everything is sold as is and that they may not return any item they purchase. Henslin Auctions, Inc. is providing Internet pre-auction and live bidding as a service to Bidder. Bidder acknowledges and understands that this service may or may not function correctly the day of the auction. Under no circumstances shall Bidder have any kind of claim against Henslin Auctions, Inc. or anyone else if the Internet service fails to work correctly before or during the live auction. Henslin Auctions, Inc. will not be responsible for any missed bids from any source. Internet bidders who desire to make certain their bid is acknowledged should use the proxy-bidding feature and leave their maximum bid 24 hours before the auction begins. 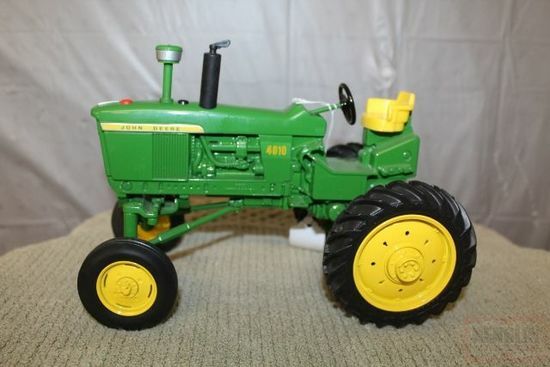 Henslin Auctions, Inc. reserves the right to withdraw or re-catalog items in this auction. BUYER'S, PLEASE READ TERMS BELOW PRIOR TO BIDDING AND BUYING!! THANK YOU! !